On a long motorway trip, it is good to take a break, have a coffee, stretch your legs, and grab some fresh air. But if you just need a coffee, this could be the answer, for the new Fiat 500L, which will be released later this year, will come with a coffee-maker next to the gear-stick. 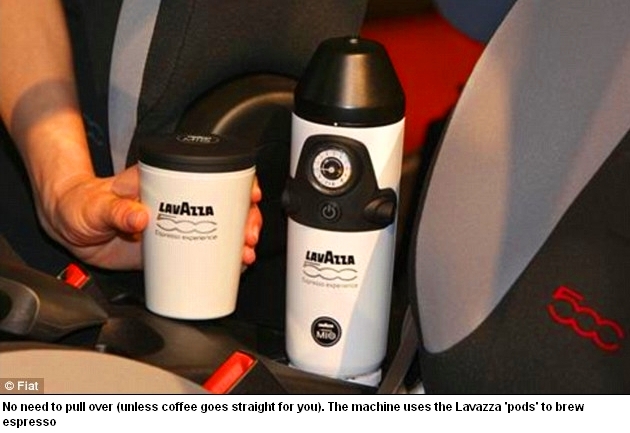 The Lavazza-branded kit even comes with a sugar container, ‘pod dispenser’, and a spoon. If you’re more of a car fan than a coffee lover, then the vital stats are that the 500L comes in a three- and five-door option with a 1.6lt, 16 valve engine. The FIAT 500L was officially launched last week in Turin, and it goes on sale in Ireland at the end of the year. Fiat proudly exclaims that this ‘is the first production car in the world available with a fully integrated espresso coffee machine as an accessory’. The car drives at a coffee-spilling 103mph, and comes in for an estimated £15,500. The self-heating coffee kit, according to some sources, will come in at around 250EU on top – quite a large upfront outlay, but a heavy driver will probably make that up in savings for overpriced garage coffee over the course of a year. st In coffee offers a 30 day guarantee, free shipping on espresso machines, coffee grinders, coffee supplies, frothers, Super Automatic Espresso Machines, Jura Capresso Espresso Machines, Jura coffee machines, coffee makers purchased over $50, lowest price guaranteed, sales tax not charged, except in New Jersey. New Jura Giga 5 - The world's finest super automatic espresso machine.